Gingerbread Macarons - Do You Know The Muffin Man? Notes: The recipe for the macarons calls for grinding the almonds and sugar for one minute in the food processor to make a very fine powder. I noticed that this recipe uses icing sugar and ground almonds in a similar proportion (about 2:1) as David Lebovitz' recipe. However, the recipe from Clement (which everyone seems to start with) uses a 1:1 proportion. 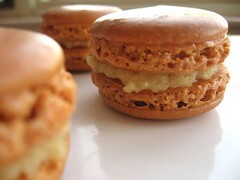 I've found Clement's to be much harder to work with, so my standard macaron batter from now on will be Sherry Yard's. I had no trouble with piping and all of the macarons came out with smooth tops. If you overbake, the colour will be a bit darker and the shells a bit crisper. The Fuji apples in the compote stayed pretty firm after caramelizing. After whizzing them to break them down, there were still detectable bits of apple. The mixture seemed a bit watery, but thickened while on ice. The instructions are very detailed so this shouldn't be too difficult for a determined baker. The results are well worth the effort: the macaron shells are tinted a nice shade of brown by the molasses and have a gentle hint of spice, while the apple compote is both complementary and contrasting. Do try these.